Curry and Harden's sneaker deals will likely keep them out of Space Jam 2. LeBron James' quest to find a supporting cast to join him on the set of Space Jam 2 has reportedly proven to be quite difficult. Earlier this week, Giannis Antetokounmpo explained to ESPN's Malika Andrews that he turned down the opportunity to be featured in the film. Now, Tatiana Siegel of The Hollywood Reporter has revealed that fellow NBA superstars Stephen Curry and James Harden likely won't take part either, because of their brand affiliations. As Siegel reports, "Nike is essential to the Space Jam franchise." As we know, Curry is the face of Under Armour, while Harden is Adidas' top guy. So what about Kevin Durant? He's a Nike guy, after all. 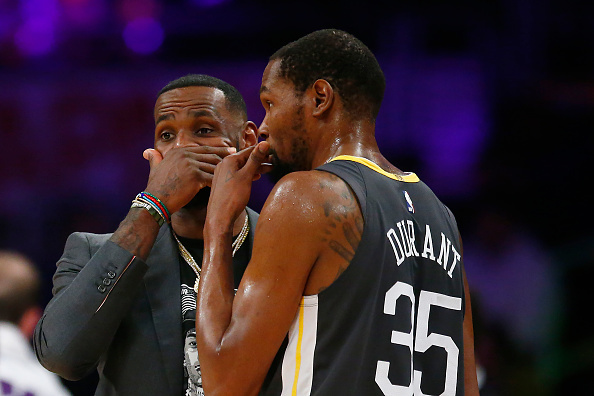 According to The Hollywood Reporter, KD is more interested in pursuing his own media projects, including the Apple series "Swagger," the scripted basketball drama inspired by Durant's AAU playing days. In addition to the information regarding which players are unlikely to be featured in Space Jam 2, Siegel also provided some insight about the script, specifically how LeBron's family arc will play a central role in the film, rather than a roster of NBA All Stars. "Those familiar with the script say Space Jam 2 will rely less heavily on a Dream Team of hoops luminaries than the Michael Jordan-led film, which saw more than a dozen real-life NBA stars cameo and grossed $231 million worldwide, not adjusted for inflation. Instead, LeBron's family arc is key, with a yet-to-be-cast teen character named Dom as the second lead, sources say." Space Jam 2 won't hit theaters until July 16, 2021 - but you can check out the entertaining Space Jam 2 x NBA 2K trailer here.